In 1928, Frederick Griffith conducted a series of experiments with Streptococcus pneumoniae. When Streptococcus pneumoniae bacteria are grown on a culture plate, some produce smooth shiny colonies (S), while others produce rough colonies (R). Mice infected with S strain (virulent) die from pneumonia, but those infected with R strain do not develop pneumonia. Griffith killed the bacteria by heating them. When the heat-killed S strain bacteria were injected into mice, they did not kill the mice. When a mixture of heat-killed S strain and live R strain bacteria was injected into mice, the mice died. Griffith recovered living S bacteria from the dead mice. Griffith concluded that the R strain bacteria somehow were transformed by the heat-killed S strain bacteria. This must be due to the transfer of the genetic material. But he could not define the biochemical nature of genetic material. Oswald Avery, Colin MacLeod and Maclyn McCarty (1933-44) purified biochemicals (protein, DNA, RNA, etc.) from the heat killed S cells. They discovered that DNA alone from S bacteria caused R bacteria to become transformed. They also discovered that transformation was not affected by protein-digesting enzymes (proteases), and RNA-digesting enzymes (RNases). Hence, it was concluded that the transforming substance was not a protein or RNA. Digestion with DNase inhibited transformation. This suggested that the DNA was the cause of transformation. Thus, it was concluded that DNA is the hereditary material. Alfred Hershey and Martha Chase (1952) worked with bacteriphages. Viruses that infect bacteria are called bacteriophages. They grew some viruses on a medium that contained radioactive phosphorus. They also grew some other viruses on medium that contained radioactive sulfur. Phosphorus is present in DNA but absent in protein. Hence, viruses grown in the presence of radioactive phosphorus contained radioactive DNA. Sulphur is present in protein but absent in DNA. Hence, viruses grown on radioactive sulfur contained radioactive protein but did not contain radioactive DNA. Radioactive phages were allowed to attach to E. coli bacteria. Then, as the infection proceeded, the viral coats were removed from the bacteria by agitating them in a blender. The virus particles were separated from the bacteria by spinning them in a centrifuge. Bacteria which were infected with viruses that had radioactive DNA were radioactive. This indicated that DNA was the material that passed from the virus to the bacteria. Bacteria which were infected with viruses that had radioactive proteins were not radioactive. This indicated that proteins did not enter the bacteria from the viruses. This proved that it is the DNA that was passed from virus to bacteria. This proved that DNA is the genetic material. It should be able to express itself in the form of 'Mendelian Characters’. Ability to Replicate: Both DNA and RNA have the ability to replicate. But protein does not fulfill this criterion. Stability: As shown by Griffith’s experiment; DNA could not be destroyed even on heating. Being a reactive molecule, RNA is easily degradable. Moreover, RNA also has catalytic property. But DNA is less reactive and more stable. Presence of thymine at the place of uracil also confers additional stability to DNA. Ability for Mutation: Both DNA and RNA are able to mutate. But RNA mutates at a faster rate. Coding for Protein: RNA can directly code for the synthesis of proteins. DNA is dependent on RNA for synthesis of proteins. Thus, it can be said that protein synthesizing machinery has evolved around RNA. So, both RNA and DNA can function as genetic material. But DNA is the preferred genetic material because it is more stable. During replication; the two strands separate and act as a template for the synthesis of new complementary strands. 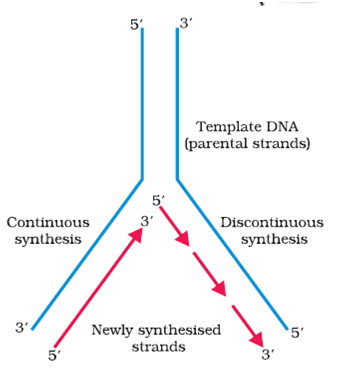 After the completion of replication, each DNA molecule has one parental and one newly synthesised strand. This scheme of replication was termed as semiconservative DNA replication. They grew E. coli in a medium containing 15NH4Cl as the only nitrogen source for many generations. As a result, 15N was incorporated into newly synthesised DNA (as well as other nitrogen containing compounds). This heavy DNA molecule could be distinguished from the normal DNA by centrifugation in a cesium chloride (CsCl) density gradient. NOTE: 15N is the heavy isotope of nitrogen. It is not a radioactive isotope. It can be separated from 14N only based on densities. Then they transferred the cells into a medium with normal 14NH4Cl and took samples at various definite time intervals as the cells multiplied, and extracted the DNA that remained as double-stranded helices. The various samples were separated independently on CsCl gradients to measure the densities of DNA. The DNA that was extracted from the culture one generation after the transfer from 15N to 14N medium had a hybrid or intermediate density. DNA extracted from the culture after another generation was composed of equal amounts of this hybrid DNA and of ‘light’ DNA. The process of replication requires a set of catalysts (enzymes). The main enzyme is referred to as DNA-dependent DNA polymerase, since it uses a DNA template to catalyse the polymerisation of deoxynucleotides. Deoxyribonucleoside triphosphates serve dual purposes. In addition to acting as substrates, they provide energy for polymerisation reaction. In addition to DNA-dependent DNA polymerases, many additional enzymes are required to complete the process of replication with high degree of accuracy. The two strands of DNA cannot be separated in its entire length; due to high energy requirement. Hence, for long DNA molecules, replication occurs within a small opening of the DNA helix. This opening is called the replication fork. The DNA-dependent DNA polymerases catalyse polymerisation only in one direction, that is 5' → 3'. This creates some additional complications at the replicating fork. Consequently, on one strand (the template with polarity 3' → 5'), the replication is continuous, while on the other (the template with polarity 5'→ 3'), it is discontinuous. The discontinuously synthesised fragments are later joined by the enzyme DNA ligase. The DNA polymerases; on their own cannot initiate the process of replication. Also the replication does not initiate randomly at any place in DNA. There is a definite region in E. coli DNA where the replication originates. Such regions are called the origin of replication.